We’ve spent a lot of time during our two weeks in Istanbul simply ambling around the backstreets of Beyoğlu, exploring our neighbourhood. 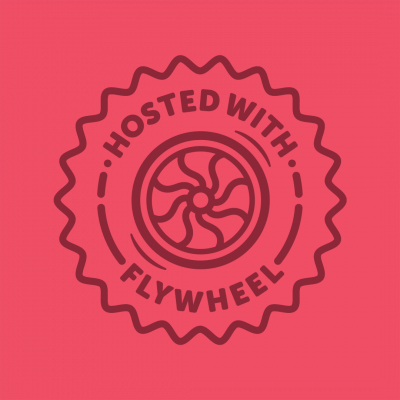 We get a kick out of taking in the atmosphere and seeing how people live their lives, and if we stumble across a venue playing music we like, that’s a bonus. And there are an abundance of those. 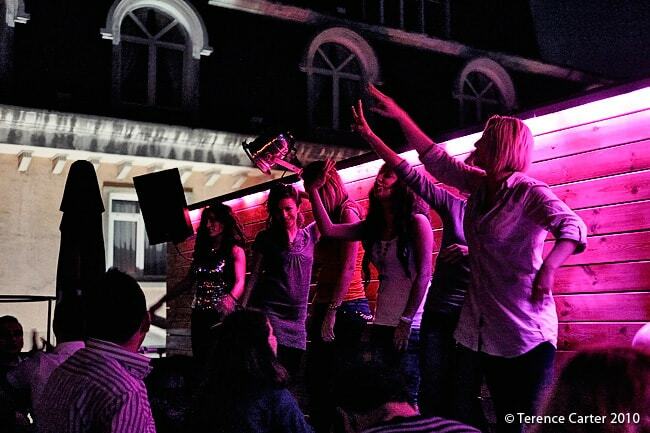 Istanbul’s live music scene is one of the best around. Beyoğlu is where it’s at. The area is Istanbul’s entertainment, shopping, arts, and cultural centre, and its main thoroughfare, Iskiklal Cadessi, and the hundreds of narrow pedestrian streets and lanes that lead off it are lined with shops, arcades, markets, restaurants, cafés, bars, pubs, clubs, music venues, cinemas, theatres, and galleries. There’s no other city like it in the world. Like most Mediterranean cities, Istanbul (which is actually on the Marmara Sea) is a city where people work to live rather than live to work, and after watching the locals for a few days and seeing the joy they get out of life, you realise how sensible their priorities are. Eating and Drinking Streets of Istanbul. Once the sun sets, that’s when the area really comes alive. The backgammon boards are packed away, Turkish coffees are replaced with beers, the tables outside the bars and pubs fill with friends, and the narghile guy gets real busy. Not long after, on every lane, bands begin to play somewhere. It could be a traditional three-piece roaming between restaurant tables, a rock group whose rhythms turn the pavement into a dance floor, a smooth jazz quartet that has heads bobbing and feet tapping in time to the tempo, or a folk band that has its nostalgic audience singing along as they wipe away melancholic tears. A single building in Beyoğlu might boast half a dozen nightspots – in the basement, at street level, on every floor, and especially on the rooftop – to eat, drink, listen, sing, and dance to music. There is such a mindboggling choice that it can be overwhelming the first time (or three) that you explore the area. It was only after wandering through every night for a week that we finally felt like we had a grip on the different vibes of each street. Istanbul is a 24-hour city, and while many cities around the world also lay claim to that title, few actually are. 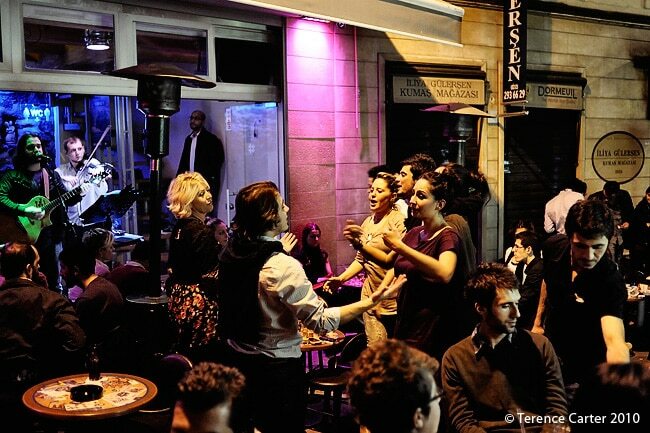 In Beyoğlu, there are people around doing something somewhere on the streets of the city every hour of the day. There isn’t a dead corner anywhere. But it’s that time between sunset and sunrise, when this part of the city moves to a rhythmic beat, when the streets throb with locals of all ages listening, singing or dancing to some form of music, that there’s a palpable energy to this part of Istanbul that is simply irresistible – and makes it hard not to join in. ASMALıMESCIT The dozens of pedestrianised lanes in this tiny quarter, named after its narrow ‘main street’, Asmalımescit Cadessi, must have the highest concentration of restaurants, cafés, bars, pubs, clubs, and music venues, anywhere. 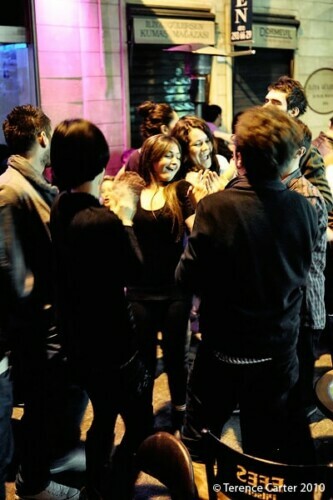 Popular spots include Babylon, Nublu Istanbul, Ghetto, Jolly Joker, and Nu Pera. We also like the stylish bar, Ugly (Sofyali Sokak 20). NEVIZADE SOKAK Lined with meyhanes (traditional taverns), bars and pubs, this skinny lane (and surrounding lanes) is the place to come if you want to hear some traditional music while you eat. Some bands roam between different restaurants, while some restaurants have their own bands that move between tables. We love this basement venue, hidden behind velvet curtains, with round wooden tables and chairs, wooden floorboards, and a small bar. This is where we first saw the brilliant Turkish trumpet-player, İmer Demirer, perform with his quartet, including the extraordinary pianist Serkan Özyılmaz (this guy is fascinating to watch). There’s a cover charge, but the night we went it included two drinks each, making it far better value than Nardis, and if someone of the calibre of Demirer is playing, it’s an absolute bargain. With a funky vibe – think: kaleidoscopic lighting and experimental films projected on the walls – this low-key spot is a fun venue for seeing jazz. Popular with local hipsters, it’s owned by the Istanbul-born saxophonist Ilhan Ersahin (who also owns Nublu in New York), and is actually part of Babylon (yes, that’s where the thumping music is coming from). Shows here are often free and drinks are cheap. 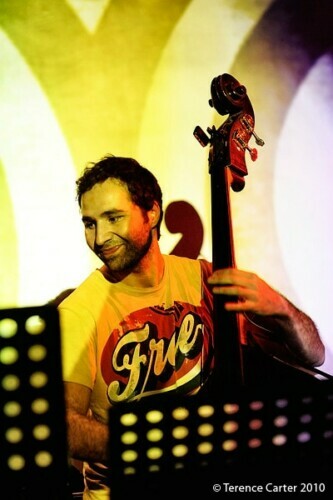 We liked the space, with a similar feel to Alt, and it has reputation as one of Istanbul’s best jazz venues. But like anywhere, the atmosphere varies depending on whose performing and the night we went a very mediocre American trumpet-player was boring the audience with over-played jazz standards. Cover charge and drink prices are steep, so you need to be familiar with the performers you’re heading to see to warrant the expense. We also liked the packed bar next door which had a local jazz band, a fun vibe, and was free. The space itself is tiny, with barely enough room to hold the bar and band, but locals fill the dozens of tiny round tables and stools on the pedestrianised lane outside, and, most of the time they’re on their feet singing and dancing anyway. This place is packed most nights of the week and the level of energy really depends on whose performing. Try to see the Black Sea folk-rocker Aydoğan Topal whose music – a unique blend of folk music from Turkey’s Laz people, which is in itself highly original – is highly contagious. Nights when Aydoğan’s performing (two-three times a week) can be crazy.